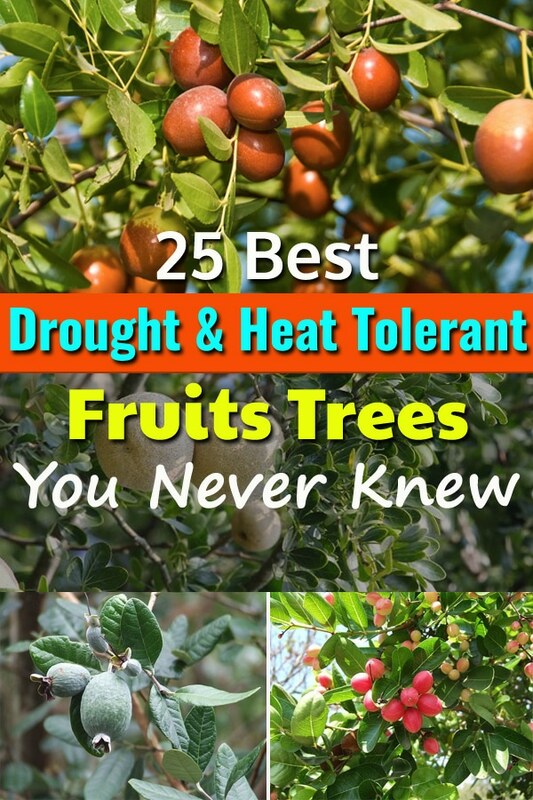 Once established these 25 best Drought Tolerant Fruit Trees need very occasional or no supplemental watering to grow and produce fruits. In hot and arid areas availability of water even for regular chore is difficult sometimes, forget about watering plants. 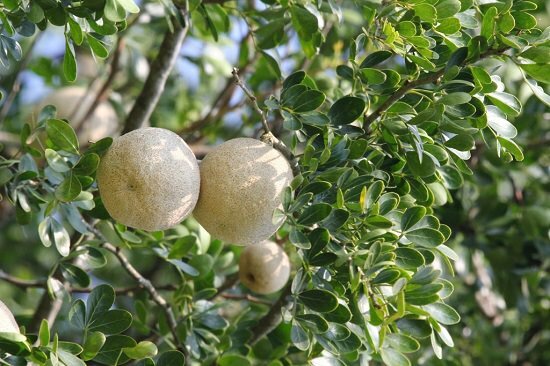 If you live at such a place or really a busy person who can’t about trees growing in your yard, then these low maintenance and drought tolerant fruit trees are perfect for you. With the fruits similar to figs in size an apple in taste with some tanginess, this phenomenal fruiting tree can reach a height of 40 feet. Plus, if you do not pluck the fruit and let it become dry and shriveled up, it’ll last forever without any preservative. Also, note that the fruits of the Chinese jujube varieties are sweeter and bigger than their Indian cousins. Locate it in full sun and well-draining sandy-loamy soil, it grows well in poor hard clayey soils as well. 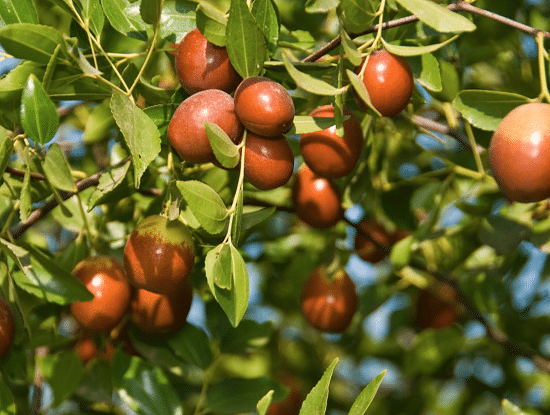 Remember, Indian jujube varieties are more drought and heat tolerant than Chinese varieties. It tops the list of exotic fruits and why not! The bright pink outer shell with scales give the fruit a unique, appealing look. Fruits are also rich in fiber, potassium, antioxidants and vitamin C making it invaluable. 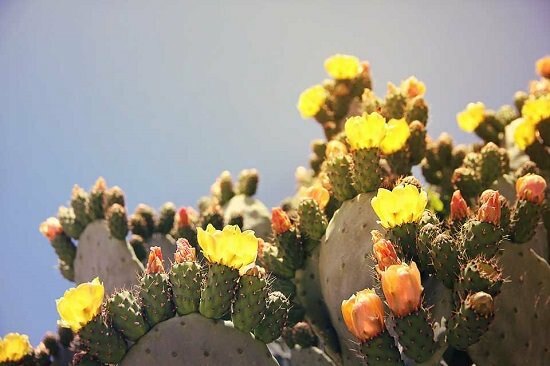 Being a cactus, it requires well-draining soil with lots of sunlight for optimum growth. Water only when soil turns dry to touch. It needs sturdy support as its a vining plant. Valued both for its ornamental beauty and tropically flavored fruits. Juicy fruits also have a thirst quenching quality to them. Ranging from white to yellow to orange the flowers are very showy and charming. Apart from tropical regions, it can do well in mild climates and can tolerate some cold (-8 C) and wet climates. For a fruiting and thriving plant locate it in a sunny spot. 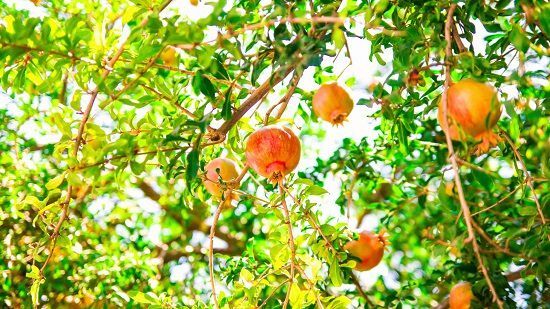 Pomegranate is actually a shrub, which can be trained as a small tree. It doesn’t grow above 12-15 feet tall. Given proper care, it can stay alive for more than 200 years. The fruit is delicious and juicy and packed with antioxidants. It does well in full sun to partial shade in the slightly acidic to neutral potting medium. If growing on the ground, in the initial growing period, water it regularly, but once the tree has established deep watering once in a week in a warm climate is sufficient. 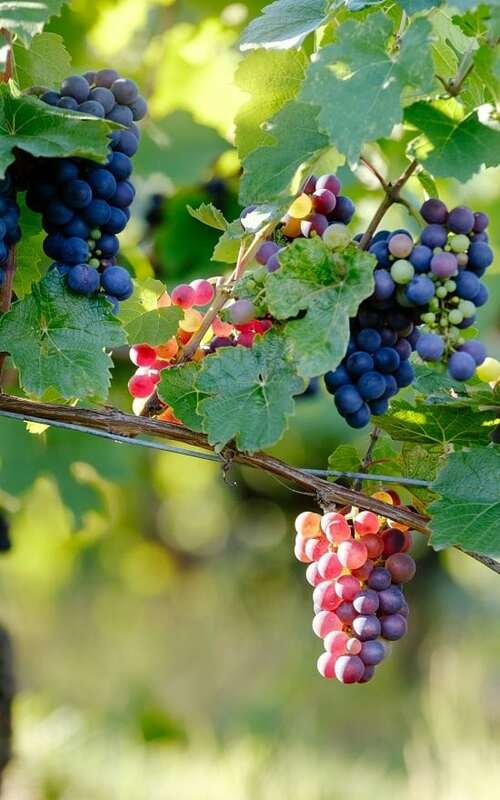 The grapevine is very common and grown commercially for wine production, juice production, and table grapes. It’s found in recent research that grapevine is very drought resistant and can tolerate heat easily. Grow it where it can receive 6-8 hours of sun each day in a well-draining sandy or loamy soil. Pruning is crucial for maximum yield. Native to South Africa, it is a small to medium size tree and can grow to a height of 6-9 meters tall. The fruit is ovate and posses an acidic flavor which leaves an extremely acidic and funny but pleasant taste in the mouth. Also, the fruit is highly aromatic and used in jams, sorbets and fruit salads. It can grow in highly saline soil and is also drought resistant. You can locate it in full sun or partial shade in a well-draining growing medium. Don’t mistake the fruits for tomatoes; they might look alike but are different. It’s the national fruit of Japan and why not it’s nutritious and very unique in taste. 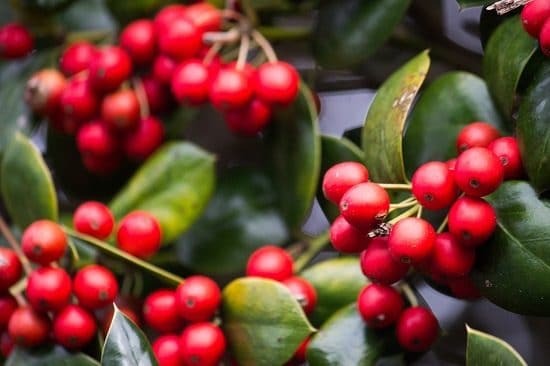 In winters, the bright orange-red fruits dangling on bare branches are enough to add winter interest to any landscape. Prune when the trees are young for optimum fruiting. Will do well in neutral to slightly acidic soil. It can tolerate short drought periods but thrive best with regular watering. 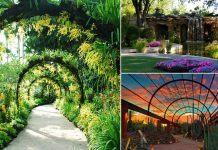 There are many varieties available for both cold and hot climates. Figs produce deliciously sweet fruits that are rich in potassium, calcium, and other dietary fibers. They are easy to plant in both garden and containers. 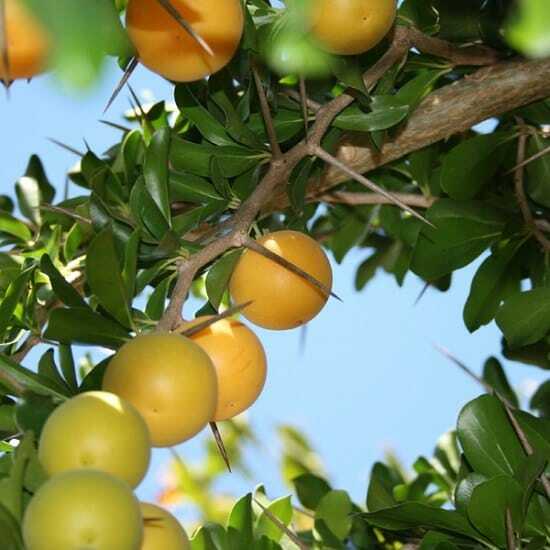 This small fruit tree or large shrub can tolerate short periods of seasonal drought due to its large deep roots. 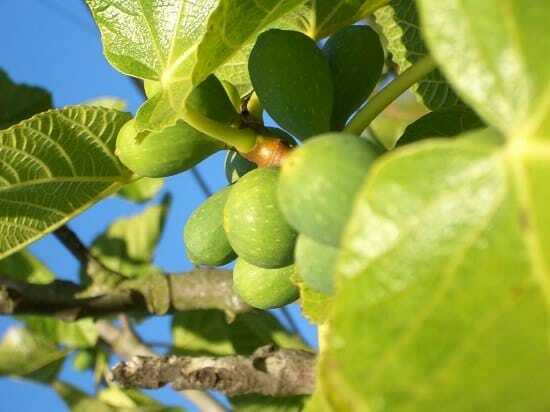 Put your fig tree at a spot where it can receive around 6-8 hours of direct sun. It prefers warm climatic conditions, but go for more cold-hardy varieties such as Chicago Hardy if you live in colder regions. Dark green foliage, spiny branches, and white star-shaped aromatic flowers enhance its ornamental beauty. The mouthwatering red fruits are rich in vitamin A, B, and C and can be used in various soup, pie, sauce and salad recipes. For optimum results plant it in full sun. It is adaptable to harsh conditions like heavy shade, moisture, drought, heat, and intense sun. It can’t tolerate cool winters, so it’s a good idea to grow it in a container in temperate zones. 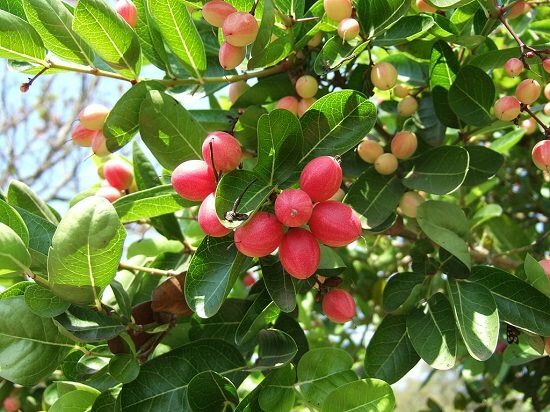 Reddish white Flowers, as well as guava-like fruits, both are edible. It bears reddish fruits in fall which are fragrant and contrast well with the dark green foliage. Its self-pollinating nature and manageable size make it perfect for small space. Can tolerate temperatures as low as 12 F (-11 C). Fertilize once in every two months with a light and well-balanced 8-8-8 fertilizer. Young trees require weekly watering whereas watering needs recede as the tree matures. 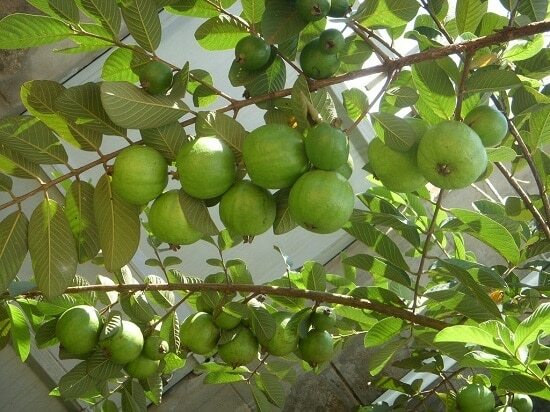 The small-sized guava tree is an ideal choice for container gardeners as well. It produces nutritious fruits that taste like a combination of strawberries and pears, though really soft while chewing. Fruits are eaten fresh or used widely in jams, juices, and chutneys. It bears fruits year round at regular intervals in tropics. Protection from cold and frost is necessary to keep the plant alive. Soil rich in organic matter gives the best results. Requires deep and regular watering when the plant is young. 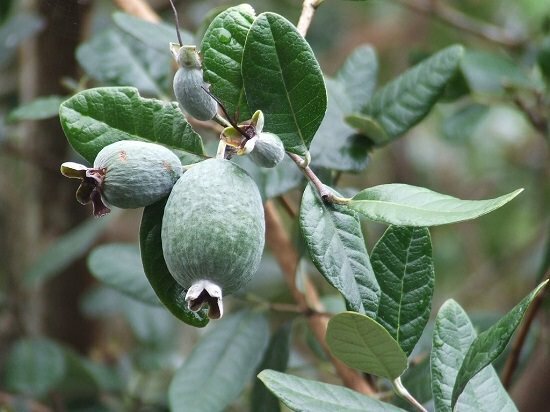 Check out our guava growing guide to learn how to grow it. This is the fruit tree that thrives on neglect. Widely used in cuisines for flavoring and in many Asian curry and chutney recipes, its pulp is a key ingredient. Plus, it is used in traditional medicines because of the laxative properties and effectiveness against bacteria and fungi. Make sure the climate is warm enough and sunny if you plant it outdoors. It prefers deep loamy soil with good drainage. 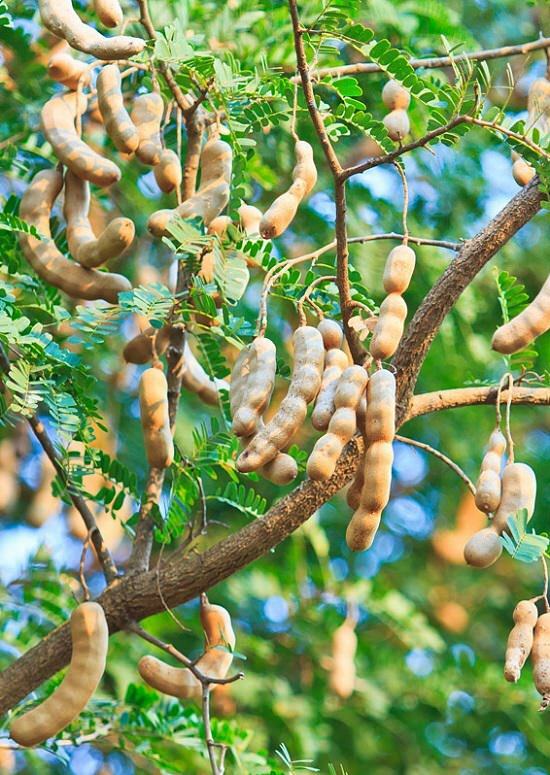 A well-established tamarind tree can tolerate long periods of extreme drought. 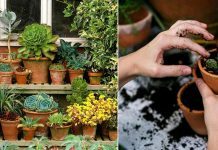 In cool climates, you can keep it indoors in winters while growing it in containers. It’s also grown as a bonsai. It produces a berry-sized fruit that is extremely tart and is commonly used in curries, pickles, and spices in the Asian countries. Priced for its medicinal uses in Ayurveda because it treats ailments such as stomach pain acidity, indigestion, fresh and infected wounds, skin diseases, urinary disorders, and diabetic ulcer. It flourishes best in hot climates and requires full sun to part shade. This woody shrub or small tree needs sturdy support in the beginning when it’s establishing. 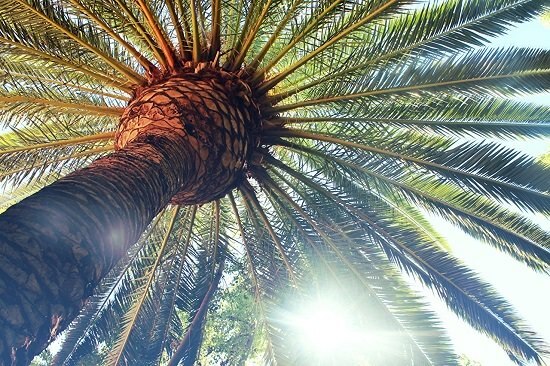 Bring the tropical feel of deserts to your backyard with this low maintenance palm. For growing in a container and indoor plantation go for Pygmy date palm, which is smaller in height in comparison to the true date palm. In winters, water a couple of times in a month, whereas in summers, water weekly. It suffers damage from frost and cold so provide shelter if growing in a cool climate. Constantly look out for common pests such as mites, aphids, scale, whitefly, and mealy bugs. It’s not just by chance that mango became king of fruits. The delicious juicy fruit backs up this title with the rich flavor and satiating aroma. Consuming this fruit has excellent health benefits as it boosts immunity, lowers cholesterol, good for eyesight, etc. 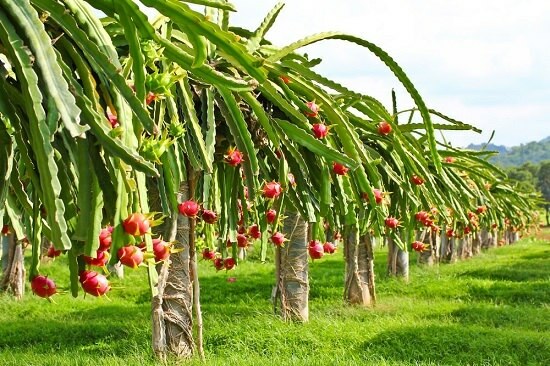 Fruit production is best in full sun, so locate the plant likewise. Avoid really wet and heavy soil, rest all are suitable. 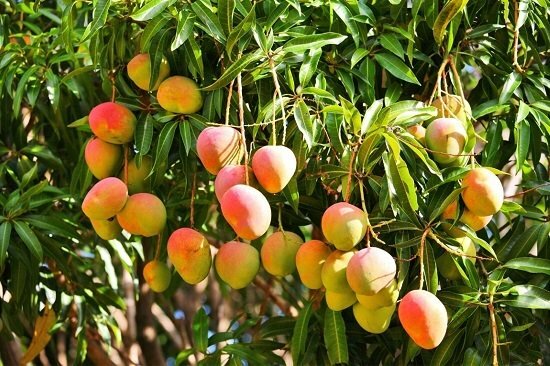 When the plant is young, water regularly, established mango trees are extremely drought tolerant. Learn how to grow a mango tree in a pot in our guide here. A wonder plant when it comes to medicinal uses and benefits. Fruits, seeds, flower, leaves, and bark all are utilized in making medicine. Because of its high content of calcium, potassium, vitamin A, C, and antioxidants, its also called a miracle tree. It’s a wild tree, which can tolerate drought and poor soil easily. 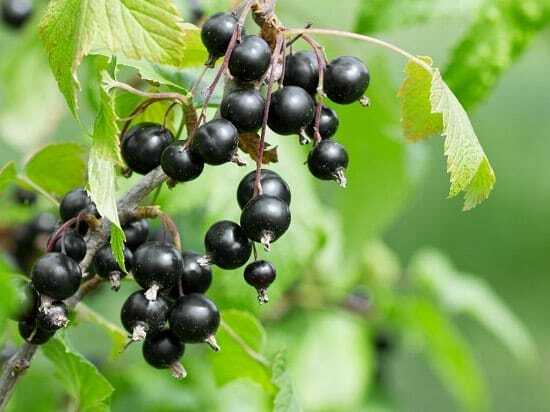 To encourage fruiting, cut back the older branches and flowers in the first year. Check out our growing guide to learn more. Phalsa is a large shrub or small tree that can be grown in containers. It produces berries akin to grapes in shape, size, and taste. Rich in antioxidants, Vitamin C and other nutrients you can prepare delicious phalsa juice or consume the berries raw. It prefers the warm climate but can tolerate the light frost. 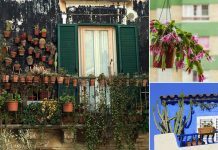 Plant it in containers so that you can move it indoors in winters. It’s a drought tolerant plant but adequate watering during fruiting is required. Tip: For growing phalsa in containers, choose dwarf busier varieties. Not only does it inherit the sweetness and juiciness of common pear but it has also got the crunchiness of an apple. You can benefit from the goodness of this fruit for months as it’ll stay edible for a long time in the refrigerator. It needs regular and deep watering when the plant is establishing. While it can tolerate a season of drought easily, keeping the soil slightly moist let the plant remain in optimum condition. The goodness of chocolate without the added calories is the reason why it’s considered as a healthy substitute for chocolate. Growing up to 10 meters tall it’s a deciduous tree, and the canopy of foliage provides welcome shade in hot tropical regions. 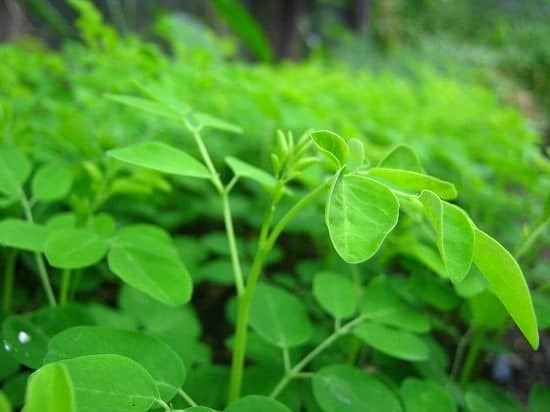 Can grow in many soil types such as deep sandy, loamy or even arid soil but won’t tolerate acidic substrate. 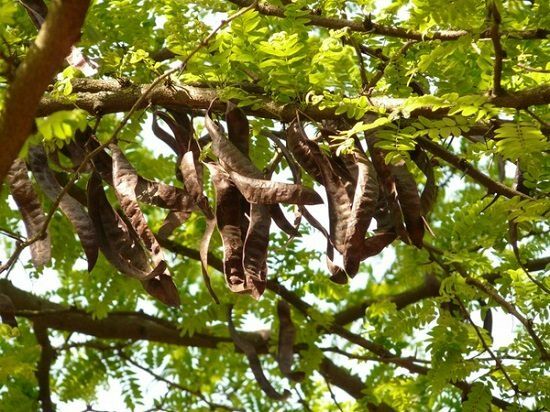 Learn to Grow a Carob Tree in our growing guide. 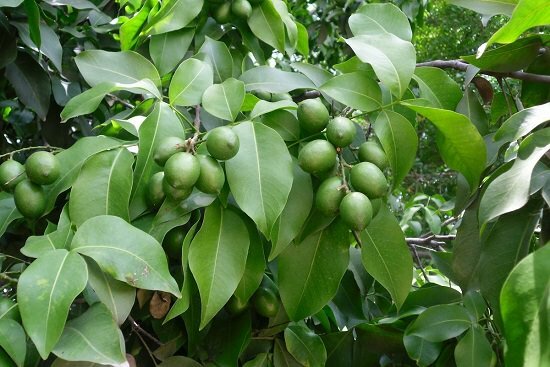 It’s a tall, erect tree that can reach a height of 25 meters and produces juicy fruits with hard green shells that resemble small unripe mango. The inner soft pulp is somewhat sweet and sour. Frost is the death of this plant. It’s very drought tolerant and doesn’t mind poor soil. 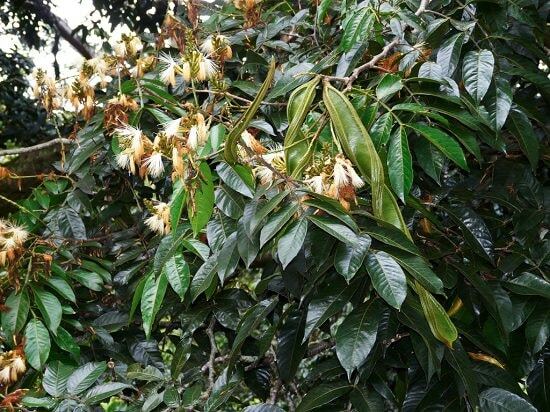 Check out every information you need on Growing Mamoncillo in our article. 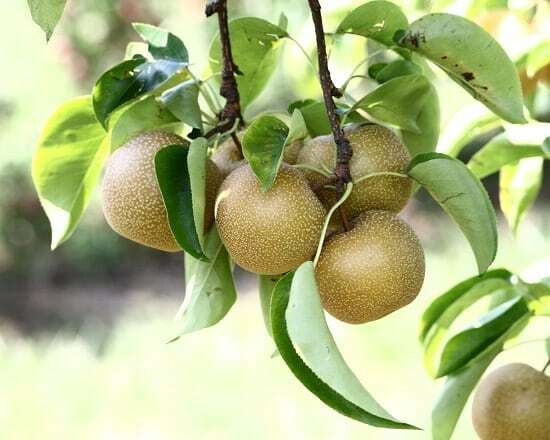 It gets this unique name “Wood Apple” because of the hard woody outer shell of the fruit. It is native to the Indian subcontinent and extremely drought tolerant. The fruits are a rich source of fiber and vitamin C. *It holds a religious value in Hinduism. Stake the plant when it is young to help it grow straight. Hot summers and mild winters are what it needs. Avoid the location with water stagnation. It can live for more than 100 years, quite a long life! Also, it can grow up to 30 meters (100 feet) tall. 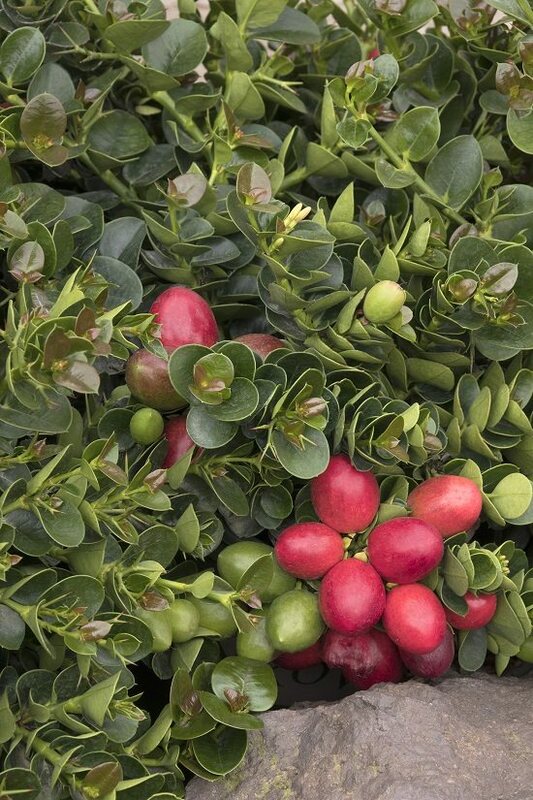 The purple-colored ripe fruits are juicy and posses sweet flavor with a hint of sourness. These rare fruits are extremely nutritious and beneficial for people who have diabetes. Find out its medicinal benefits here. Keep the soil moist for seedlings and young plants, reduce the watering once it is established. It can grow in a wide range of soils and requires moderate shade to full sun. The beans in the foot long pod are surrounded by white and smooth cotton-ish pulp that resembles the taste of vanilla ice cream. Yummy isn’t it! The beans are used in traditional medicines for treating dysentery, diarrhea, and reliving arthritic joints pains. A warm location and a spot that receives sunlight throughout the day is where it’ll do best. It’s drought tolerant after establishment but will produce bountiful harvest if you water it once in a while. 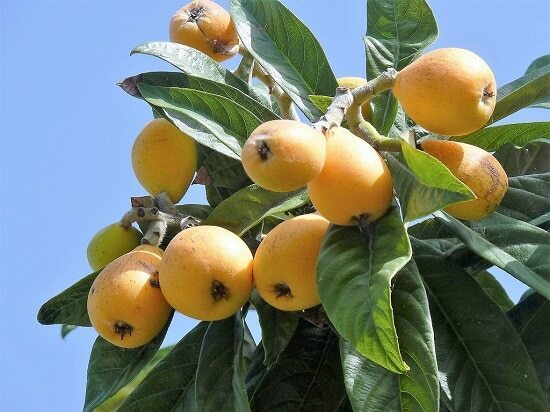 If you are looking for something new to plant go for Loquat. It adds ornamental beauty to any landscape with the large glossy leaves and bright fruits. Jams, jellies, preserves, cobblers, and pies can be prepared by the fruit. This large shrub or small tree can be grown in containers as well, the height will be reduced to 6-8 feet. It can live well in mild temperate zones as well and tolerate temperature down to 20 F (-6 C). It’s drought tolerant but for quality fruits, water regularly and deeply, especially in summer. 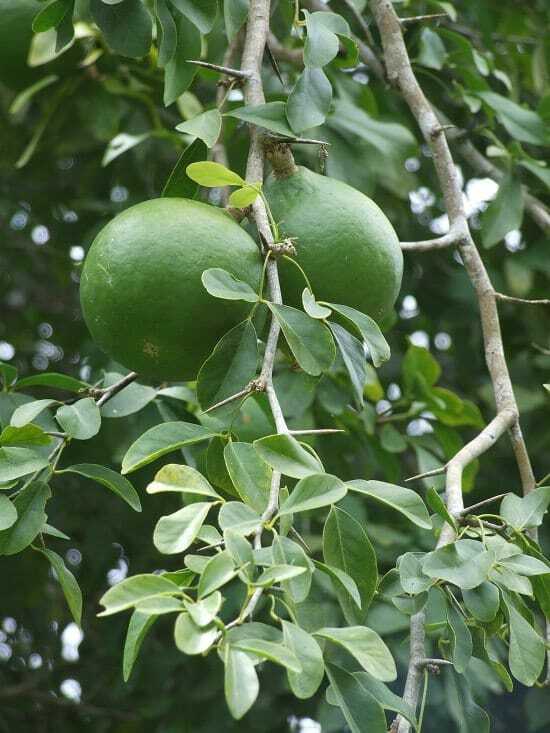 This fruit tree is native to India and Sri Lanka and found naturally in other South East Asian countries. 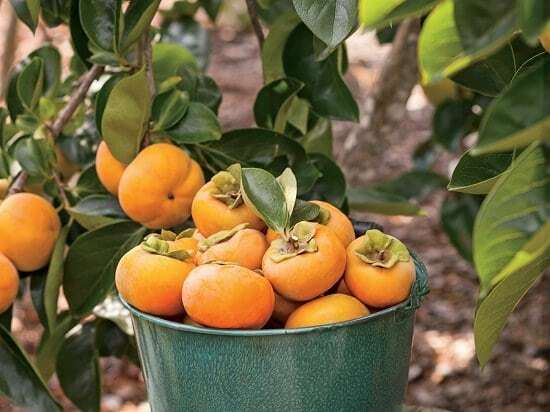 It’s one of the best drought tolerant fruit trees, which can grow quite tall. The taste of its fruit is rare–very acidic and sweet. It resembles the bael fruit in shape and size. It requires a warm, arid climate to grow and thrive. It requires regular watering when it’s young, once established, it thrives on neglect.